A simple but effective helper that will allow you to track both global and local market trends. 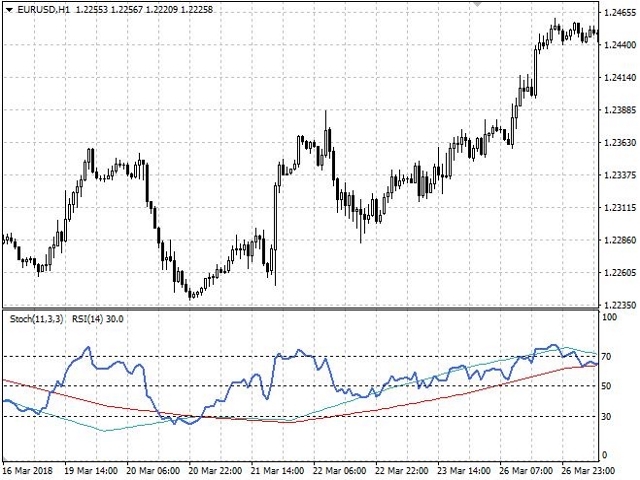 The indicator combines the work of two oscillators: Stochastic and RSI. Both indicators can be set to any timeframe. Multitimeframe - you can adjust both indicators to the desired timeframes. To obtain the entry points, you can use the Elder's triple screen system. Highly customizable - you can configure not only the parameters of the indicators, but also their appearance (color and width of lines). Time-saving - you will not have to switch between timeframes and reattach the indicators every time. These problems are solved by combining the indicators in one window. Stochastic TF - timeframe of Stochastic. Stochastic % K period - %K period of Stochastic. Stochastic % D period - %D period of Stochastic. Stochastic slowing - slowing of Stochastic. Stochastic MA method - MA method of Stochastic. Stochastic price field - price type of Stochastic. RSI TF - timeframe of RSI. RSI period - period of RSI. RSI apply to - price type to calculate RSI. Stochastic main line color - Stochastic main line color. 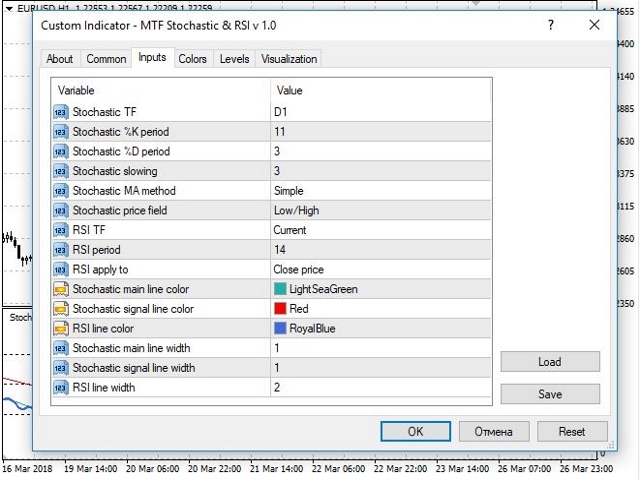 Stochastic signal line color - Stochastic signal line color. RSI line color - RSI line color. Stochastic main line width - Stochastic main line width. Stochastic signal line width - Stochastic signal line width. RSI line width - RSI line width.